Combat sport athletes and their coaches are all aware of the vital importance of nutrition for fuelling performance, maximizing recovery and successfully making weight. Unfortunately, much of the common advice they receive in this area is often sub-standard, counter-productive and even dangerous. The result is that athletes may end up using strategies that are much less ineffective than they could be. In this seminar we will explore strategies that are based on sound scientific principles, clear supporting evidence and actual case studies of them being used in practice with professional combat sport athletes. Danny Lennon is the founder of Sigma Nutrition. Danny has a masters degree/MSc. in Nutritional Sciences and a BSc. in Biology & Physics. As a performance nutritionist he has worked with many combat sport athletes including professional MMA athletes, professional boxers, international judokas & taekwondo athletes, national champions in Muay Thai and competitive Brazilian jiu-jitsu athletes. His approach is based around a strong understanding of scientific principles, constant reading of research and expericence of working with combat sport athletes in the real world. 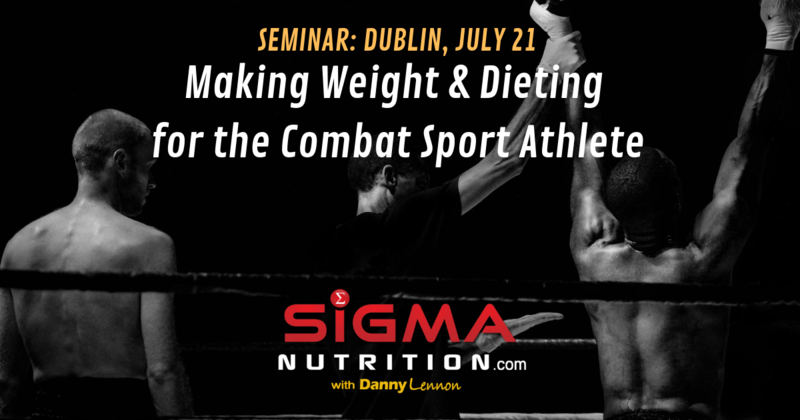 In 2017 Danny published the ‘Sigma Weight Cutting System for MMA & Boxing’, which has been successfully used by coaches, nutritionsists and athletes to make weight and win in 23 countries across the world. Since then Danny has continued to refine his recommended practices based on the latest emerging research in combat sport nutrition and weight cutting, as well as on new practices he has experimented with in his athletes. Danny is the host of the Sigma Nutrition Radio podcast, which has over 3 million downloads to date. Bonus resources: intake calculator, weight cutting tool, etc. The seminar will be invaluable to combat sport athletes, sports nutritionists, S&C coaches and combat sport coaches. The event is expected to run from 9.30 am to 3.30 pm, including an hour break for lunch. Yes, those with a valid 3rd level student card will be valid for a 10% discount off their ticket. To redeem the discount, just use the code STUDENTPASS at checkout. NOTE: Will will need to either present your card on the day of the event to gain entry, or send a photo of the card via email in advance.